Join us for an introduction to the unique habitats of Northern Neck. The Coastal Plain is home to several of Virginia’s showiest orchids and while not all will be in bloom, we hope to see all that are. We will visit well-preserved coastal woods, swamps, marshes and an upland meadow. The trip will go on rain or shine, so watch the forecast for Kilmarnock, Virginia, to determine if you will need rain gear or insect repellent or both. Detailed directions will be provided with registration. Westmoreland State Park is listed on the National Register of Historic Places. Better known for birding and fossil collecting, it features a magnificent view of the lower Potomac and acres of quiet woods. There is a $5/car admission fee which is not included in registration. 11:30 We will meet at the picnic tables at the Visitor Center at Westmoreland State Park for a picnic lunch. Bring your own lunch. 1:00-3:00 Paul Billings will lead us on a hike along Big Meadow trail to Fossil Beach. Along the way we leads to a swamp where we will see button bush (Cephalanthus occidentalis), native iris, and a great view of the white cliffs of the Potomac. Rappahannock River Valley National Wildlife Refuge was established in 1996 to conserve and protect fish and wildlife resources. We all know the way to conserve wildlife is to conserve their habitat. There has been a concerted effort to restore plants native to the Bay particularly at the Wilna Pond section of the Refuge. 3:45-5:00 Master Naturalist Earline Walker will lead us on a tour of the Wilna Pond area of Rappahannock River Wildlife Refuge. Wilna Pond features a huge natural meadow. There is also a woodland trail around the pond itself which features a blanket of water lilies. 5:45 Check in at Kilmarnock Hotel. Group dinner TBA. A block of rooms has been reserved under the name of Virginia Native Plant Society for two nights. The special rate is $110. This is not included in the registration fee. 8:30 Depart hotel for Hickory Hollow Nature Preserve. 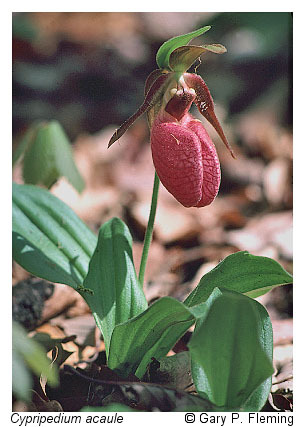 The Hickory Hollow’s 254 acres of mixed pine-hardwood forest, ravines and Cabin Swamp form an important habitat for a rare plant, Kentucky lady’s slipper, which should be in bloom when we are there. Cabin swamp is an exceptional quality wetland community that supports a very high diversity – perhaps 500 plant species – including several mountain disjuncts. A globally rare Coastal Plain Basic Seepage Swamp is a natural community highlight of the preserve. Other plants we hope to see: lily-leaved twayblade (Listera), dwarf ginseng (Panax trifolius) (will probably be past flowering), marsh marigold (Caltha), one of the coastal plain’s only populations of false hellebore (Veratrum), as well as a wide variety of sedges and grasses. 9:00-11:30 Zach Bradford and Paula Boundy will lead a hike into this wonderful woods. Chilton Woods State Forest is a Virginia state forest near the town of Warsaw. The land is part of the Rappahannock River watershed, with streams emptying into that river’s tributaries, Lancaster Creek and the Corrotoman River. Most of the forest’s trees are loblolly pine, with areas of mixed pine and hardwood. The showy orchis (Galearis spectabilis) and pink Lady’s Slipper (Cypripedium acaule) may be seen there. A plant list from May 2016 included Large Whorled Pogonias, Lyre Leaf Sage, Pussytoes, several types of ferns, including Christmas fern (Polystichum acrostichoides), Sensitive Ferns and Cinnamon, Deerberries and Huckleberries, a related species found blooming side-by-side, enabling easy comparison, a Partridge Berry, Violet, or Quaker Lady and white native Azaleas. Hughlett Point Natural Area Preserve contains several excellent examples of tidal and non-tidal wetlands, as well as exemplary undeveloped beaches, dunes, and upland forests. The adjacent 316-acre Dameron Marsh Natural Area Preserve contains one of the most significant wetlands on the Chesapeake Bay for marsh-bird communities. The Marsh supports impressive salt marsh communities, sand beach, and upland forest habitats. We may be lucky enough to see sea-beach knotweed (Polygonum paronychia), a globally rare sprawling annual that inhabits the high energy shorelines. 11:30 Depart for home. There are several interesting places to stop on the way home for optional hikes. Directions: The GPS adderss is 145 Cliff Road, Montross, Va. 22520. The Park entrance is 6 miles northwest of Montross, just off Route 3. From Fredericksburg (I-95), take Rt. 3 east, go about 40 miles to the park entrance, turning left onto Rt. 347. From Tappahannock, take U.S. 360 East to Warsaw. Turn left onto Rt. 3 west at the third stop light. Stay on this road until about six miles past Montross. Turn right into the park’s entrance on Rt. 347. From Tidewater, take U.S. 17 north to Tappahannock. At the second light, past Lowrey’s Restaurant, turn right onto 360 east, then follow Tappahannock directions. Drive Time: from Northern Virginia and Washington D. C., 2 hours; Richmond, 1.5 hours; Tidewater/Norfolk/Virginia Beach, 2.5 hours; Roanoke, 5.5 hours. Plus there is a suggested donation to VNPS of $50, which is tax deductible to you. Lodging, meals not included. We have reserved a block of rooms at the Kilmarnock Hotel at the rate of $110/night.